Going camping is a fun adventure! With summer practically here, I know for sure that camping will be on a priority list of many this year. To be honest, when I think of camping, I don’t think about comfortable beds or a good night sleep– I think about the fun my kids will have and the food. Like s’mores: a perfectly toasted marshmallow placed in between two layers of honey crackers, with a gooey melted chocolate in the center. It’s a sugar feast, a pile of goodness that you are trying to fit right into your mouth, and before you finish it, there you are placing your next marshmallow on the stick. How can I not think about food, right? Is it possible to have the s’mores without going camping? Absolutely yes! I have seen different variations over the years, but my favorite one is using a glass jar. 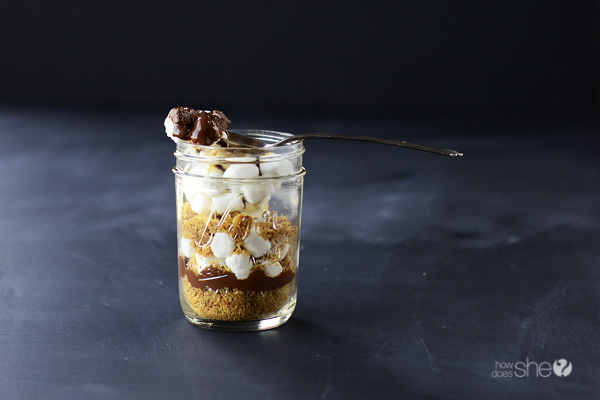 Get that tent ready right in your backyard, call the kids, and let’s start this party because today we are going to bring an outside dessert inside of the jar. As you probably know, mason jars are not just for canning anymore. I myself have dozens of them, and love to use them for individual desserts when throwing a party. You can actually put almost anything in them: smoothies, parfaits, cakes, flowers and much more. This treat will surely make you think you are at a campout! Pre-heat oven to 350°F degrees. Have all your jars washed and dried ready to be filled. Mix graham cracker crumbs and butter until well incorporated. Add about 1 ½ tablespoons of the mixture to each jar to make the first layer. 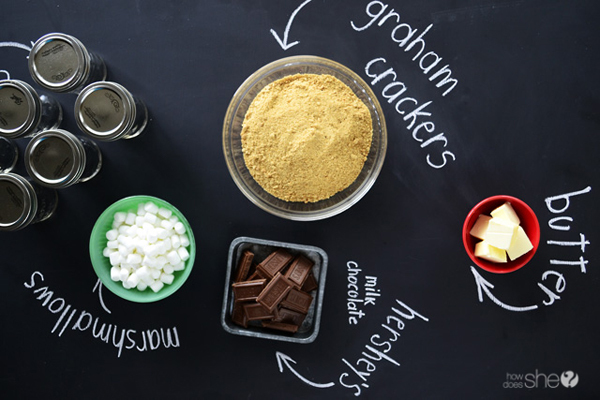 Chopped the chocolate into small pieces and add an even layer in each jar on top of the graham cracker crumb layer (about 1 ½ tablespoons). Add the marshmallow as the third layer and repeat all three layers again. Sprinkle the leftover chopped chocolate on top of the last layer (it should be the marshmallows). Place the six jars on a baking sheet. Place them in the oven and bake for approximately 15 minutes or until you see the chocolate melted. Turn off the oven and turn on the broiler and carefully brown the marshmallows for about 1-2 minutes or until golden brown. Watch the jars carefully because you don’t want to burn the marshmallows. Serve immediately. Don’t forget that summer can be a very busy season for many and chances are you will be going to a few parties. 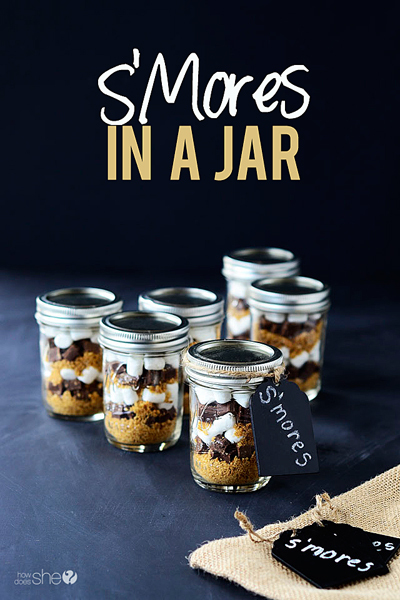 S’mores in a Jar can be a great gift option or a treat to take to a friend. Kids will love it and adults will not resist! Just print the instructions and attach them with the jar. Don’t forget to close them with the lid! Whether you camp or not this summer, this treat is a great option when gathering with friends and family. You will need six 8 ounces mason jars. Have all your jars washed and dried ready to be filled. Mix graham cracker crumbs and butter until well incorporated. Add about 1 ½ tablespoons of the mixture to each jar to make the first layer. Add the marshmallow as the third layer. Repeat all three layers again. Sprinkle the leftover chopped chocolate on top of the last layer (it should be the marshmallows). Place the six jars on a baking sheet. Place them in the oven and bake for approximately 15 minutes or until you see the chocolate melted. Turn off the oven and turn on the broiler and carefully brown the marshmallows for about 1-2 minutes or until golden brown. Watch the jars carefully because you don't want to burn the marshmallows. Serve immediately. Ana Helena Campbell is the food photographer, writer, cook, and food stylist for her blog. 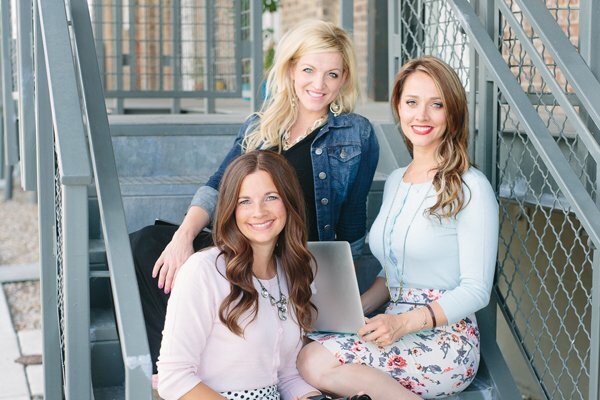 She is married to an incredible, supportive husband and is the mother of two very enjoyable teens. She is not the only girl in the house: her rescued Ridgeback Lily and her extremely happy Lab Lola even out the number of girls and boys. Since moving to America from Brazil in 1998, she has developed a passion for cooking. She has tested countless recipes, and had to learn the use of ingredients that were unfamiliar to her. In her blog anahelenacampbell.com she is dedicated to sharing foods that influenced her upbringing in Brazil and also foods that influence her today. This is so stinkin cute and looks so yummy! I will definitely be making this with my boys. We also like smore’s rice krispies that I’m sure your teenagers would gobble up :). P.S. I love that you photographed your tutorial on a chalkboard. Carina! 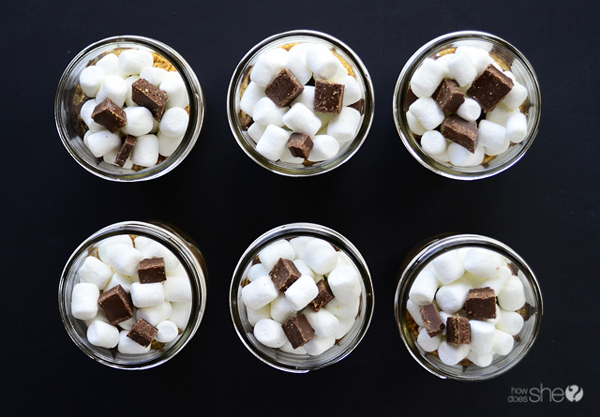 S’mores rice krispies sound delicious! Glad you like the post. Thanks! 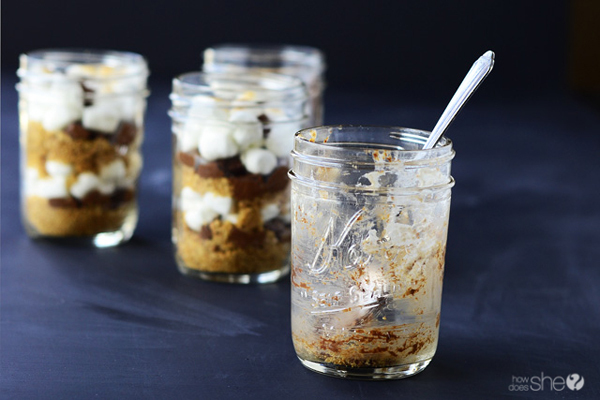 I love your Smore’s In A Jar. Since I bake for others, and do gift baskets for people, I really enjoy finding new ideas to use in the baskets. This I know will be a hit! Thanks for your creative ideas. Gift baskets are so much fun. You are very welcome Suzanne. Glad you enjoyed the post. Thanks! Looking forwards to lots of great ideas. Glad you stop by Nancy. Thanks! Looks delicious! Can’t wait to try this! One question…how do you serve it with the mason jars being so hot straight out of the oven? Do you let them cool down first? I love this!! Was wondering if I can make this without the butter to save some calories? How long will these be good for after you bake them? Can you refrigerate after they cool down and heat back up again at home? If the snores in a jar aren’t going to be eaten right away, do I still cook them? What do I put on the tag? Looking to make these for my wedding favors. Do you know if they would be good if made a week or 2 ahead of time? My mother in law says yes because most people don’t keep butter refrigerated anyways. ? Thank you from this bride to be! I MUST give this a try! I have a feeling it is going to be like heaven in my mouth!